Custom boat charter at Sandy Point, North Caicos. 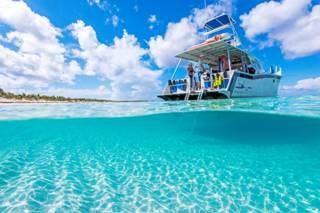 North Caicos and Middle Caicos doesn’t see the large number of visitors that Providenciales and Grand Turk welcomes, so boat charters on the two islands tend to be custom and private tours on smaller vessels. There’s an incredible array of sights and places to explore, and no two excursions are the same. Secluded Beach in the Caicos Islands. There are so many incredible places to discover! Although the largest islands in the Turks and Caicos, the quiet North Caicos and Middle Caicos only support a relatively small population. Consequently, there are only a few boat tour operators that are based on the two islands, and these vessels tend to be captained by very experienced fisherman who grew up in the islands. Several of the excursion companies on Providenciales are happy to make the short trip over to North Caicos as well. Due to the limited number of charter companies, we advise making bookings and inquires well in advance of your scheduled visit to ensure availability. 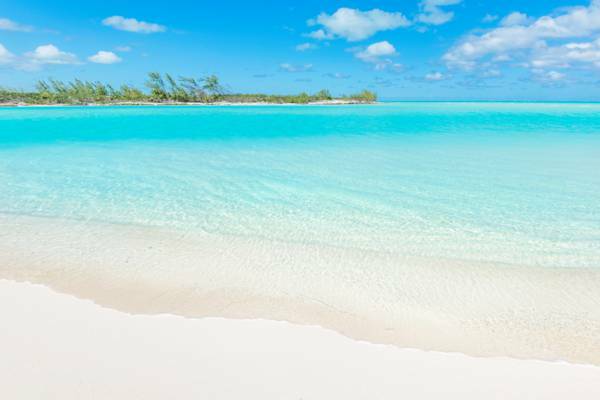 The water and cays surrounding North Caicos and Middle Caicos is a treasure trove of secluded beaches, pristine reefs, and vibrant wetlands, and one of the most beautiful areas in the Caribbean. Shallow sounds and channels are a defining feature of the incredible waters around North Caicos and Middle Caicos. These waterways are located between the expansive Caicos Banks on the southern side of the Caicos Islands group and the deep Atlantic off to the north. Consequently, there’s constant tidal water movement back and forth, which creates a perfect environment for many types of marine wildlife. 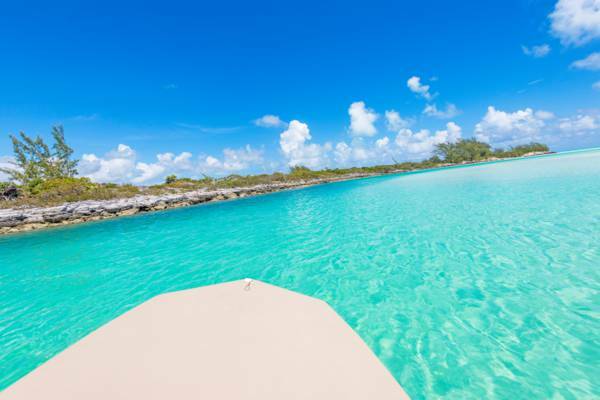 Cruising the exquisite channels near North Caicos and Middle Caicos. The tidal movement also ensures clean and clear water, which results in some of the most vibrant blue, topaz, and turquoise ocean hues you’ll ever see. On the ocean side of the channels, small and beautiful sandbars form. There are also some unusual sights hidden around the islands as well, from underwater caves and small shipwrecks, to the critically endangered Turks and Caicos Rock Iguana. The secluded and beautiful beaches of the Turks and Caicos are perfect for a beach BBQ. During the queen conch season, typically from mid-October to mid-July, a popular activity is to dive for conch, which can then prepared for lunch on the beach. The best snorkelling at North Caicos and Middle Caicos is found at offshore reefs and on the barrier reef that rings the Caicos Islands. The protected bay reefs and coral heads are found in shallow water, and are often home to an interesting cross-section of marine life. There’re are usually several types of healthy hard and soft corals, lobsters and shrimp hiding under the ledges, tiny and flamboyant reef fish such as angelfish, damsel fish, and bluehead wrasse. Sea grass beds also support fascinating creatures. Star fish and conch are dotted across the bottom, and green turtles, hawksbill turtles, stingrays and eagle rays can be seen browsing. The barrier reef offers a different aspect. Coral networks are more intricate with gullies and arch, there are fields of yellow and purple sea fans, and larger schools of fish such as horse-eye jacks, blue tangs, yellow goatfish, French grunts, stoplight parrotfish, and chub fish. The barrier reef also is closer to the deep water off the Caicos Islands plateau, so the occasional small grey reef shark can be seen gliding by. Bonefishing in the Caicos Cays. The reef fishing and bonefishing around North Caicos and Middle Caicos is also excellent. Reef and bottom fishing is perfect for all ages and skill levels, and was once the main source of food for those living in the Turks and Caicos. The catch includes Nassau grouper, yellowtail snapper, mutton snapper, mangrove snapper, horse-eye jacks, bar jacks and more. It’s easy to pick up the basics, so a good catch is very likely. Many restaurants are happy to prepare the catch for dinner – a perfect ending to the day. Flat fishing and bonefishing are more of an acquired skill. 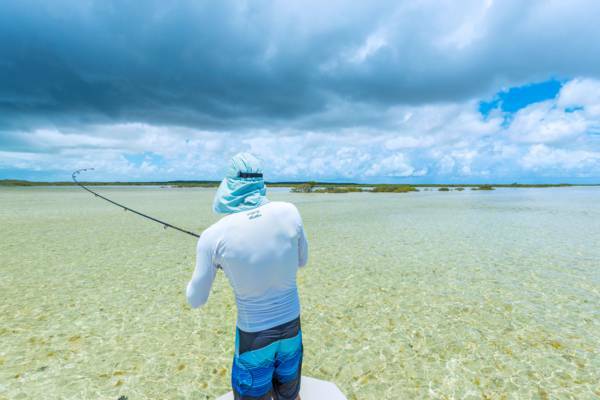 The shallows and sounds of the Caicos Banks are amazing grounds for bonefish and tarpon, and the crystal-clear water make it easy to spot the fish and muds.